The iOS game will launch later this year. The Angry Birds franchise is one of mobile gaming’s greatest success stories. In addition to appearing in tons of different video games (for both mobile devices and home consoles), the Angry Birds have their own merchandise (toys, clothing, etc. ), multiple web series, and even feature films, with The Angry Birds Movie 2 scheduled to hit theaters in the U.S. on August 16, 2019. The original Angry Birds mobile game was released on iOS in December 2009 and on Android in October 2010. It had a simple premise: Green pigs had stolen the Angry Birds’ eggs, and players needed to help the birds retrieve them by launching their new feathered friends out of a slingshot toward the pigs’ towers and defenses. While some Angry Birds games have different gameplay (for instance, Angry Birds Dream Blast is a mobile puzzle game that asks players to tap on blocks to remove them from the screen), the next game in the franchise takes the series back to its roots, albeit with an interesting twist. Angry Birds AR: Isle of Pigs will use augmented reality (AR) technology on iOS devices to cause the slingshot, birds, pigs, and towers to appear as though they’re in front of the player in the real-world. As a refresher, AR technology uses a device’s camera to display the real-world environment on the device’s screen so that in-game elements appear as though they’re in front of players (think capturing a Pokemon in the real world in Pokemon Go). A VR (virtual reality) version of the game, Angry Birds VR: Isle of Pigs, was released on PC earlier this year, but it requires a virtual reality headset to play. In each level of Angry Birds AR: Isle of Pigs, players will be able to view the pigs’ towers as though they’re in their own environment, and then physically walk around their real-world space to see the tower(s) from all sides. This will allow them to look for weaknesses in the fortifications, as well as for hidden items they may not normally see. After players line up the perfect shot, they can fling one of the Angry Birds from the slingshot toward the tower(s) in front of them. As with the original Angry Birds mobile game, the physics-based gameplay in Angry Birds AR: Isle of Pigs will encourage players to aim strategically to cause as much damage to the towers as they can with each shot. The game will have at least 40 levels for players to complete at launch. 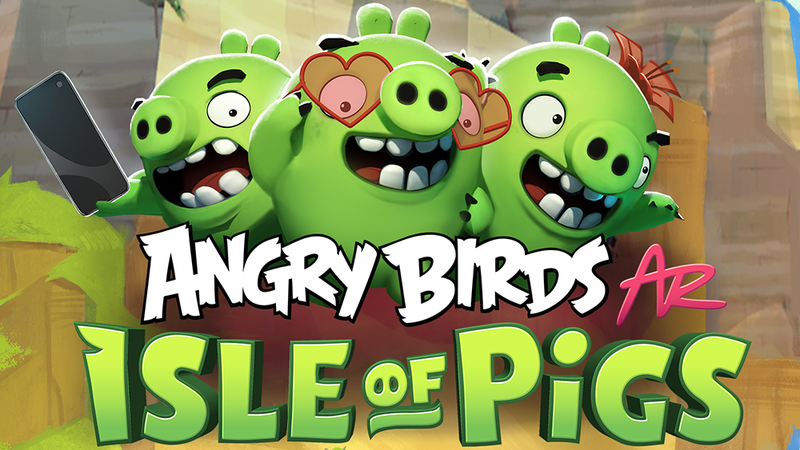 Angry Birds AR: Isle of Pigs will be available to play on iPhone 6s devices and newer, iPad 5th and 6th generation, and all iPad Pro models. The game will be available to pre-order on March 19, and it’s expected to launch worldwide in late spring 2019.